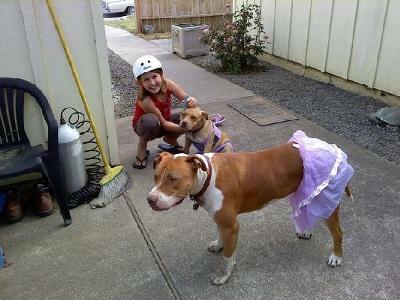 Maxx and Bella playing dress up with our daughter. Maxx is a 3 year old AmStaff(he's HUGE like a horse)and Bella is a 1 year old red nose(she's our mini pit,don't know what happened but she's so little). They mean everything to our daughter, Alyanna. These 2 dogs are so awesome with her and even allow her to dress them up.They are the most loyal dogs. Maxx came from a guy who bred AmStaffs for hunting,we don't hunt we got him to be a part of our family. Bella was a birthday present for our daughter because she begged and begged for another puppy.